We are a "Non-traditional" business consultancy, using the latest industry standards, methods and technologies to deliver substantial cost reduction for our clients. Our business provision is based on deep knowledge of the methods, strategies and systems that drive successful operations - giving us a clear competitive advantage when it comes to formulating proposals for our clients. We provide a significant range of services, specialising in "On site" WMS/TMS consulting support services, Strategic support, Management provision, End to End Supply Chain consulting, Benchmarking, Process mapping (BPM) and proactive computer aided business modelling – enabling “What if” scenarios to be run with “REAL” data, enabling specific client focus on TRUE COST BENEFITS REALISATION plus many other supporting functions. If you have a problem in your warehouse or supply chain give us a call. If your information is recorded electronically in any format we can work with you to build a management platform / performance tools to help you to take your business forward. Our practical experience, business understanding and cutting edge techniques make us one of the UK’s leading independent specialists. 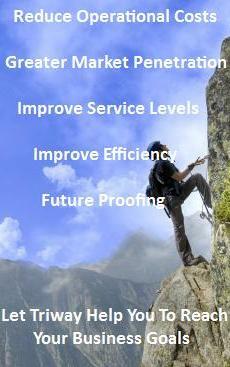 We work primarily through recommendation and across many varied industry sectors. Triway get results by using the latest industry benchmark standards alligned to the latest technical and academic research techniques. Working in conjunction with a number of leading UK universities and Industrial champions, Triway make the difference, let them help you to make the difference to your business. 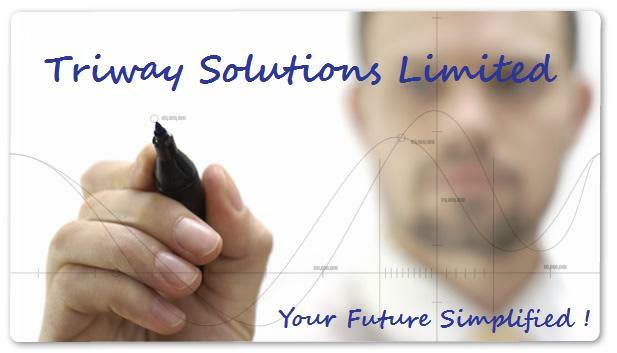 Triway Solutions Limited are a niche independent management consultancy specialising in problem solving, computer aided network modelling, operational research, programme / project support and many other aspects of commercial consultation. We provide high quality, scientific driven practical advice as a business enabler to deliver strategic results across all industry sectors throughout the UK, Europe and the rest of the world. Our experienced team comprises both full and part time specialist consultants, led by the Company Directors and supported by proven systems and professional personnel. We aim to be the preferred supplier for supply chain network modelling, bringing real added value to clients' supply chain management and strategic planning. We deliver tangible achievable results which is reflected in our client portfolio, high retention rates and consistent growth. Our clients have identified a need to proactively plan, change or review their business' with a significnat emphasis on COST DOWN INITIATIVES and recognise the benefits of independent specialist advice, technical expertise and professional guidance in attaining their goals. In many cases we provide that final missing piece that is specific to our clients business which allows the client to re-focus thier energy and drive thier business forward.